Nice to meet you. 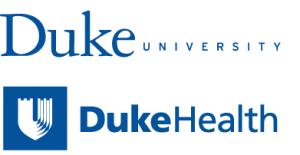 We provide strategic consulting to clinicians, researchers, and students at Duke Health and Duke University to enable them to fulfill their digital aspirations. Our team is made up of a diverse group of individuals from across Duke and supported by the Duke CTSI. Ryan has experience in leading research studies utilizing mobile apps, text messaging, and environmental sensors to optimize novel, useful methods of collecting and disseminating healthcare data to improve patient and clinical decision- making. He founded the Duke Health Innovation Lab, an interdisciplinary center for developing and testing pioneering innovations in technology and patient care delivery, which is available to the Duke community. Katie’s expertise lies in taking mobile and web apps from concept to deployment for health systems, non-profits and start-ups. She contributes a deep understanding of agile software development, Epic integration options, UX, prototyping, human centered design, and social media marketing, and leverages these skills and relationships both at DHTS and the greater Triangle digital health community to support innovators at Duke. Marissa has more than 10 years of experience in clinical research in both industry-funded and federally-funded projects. Her experience includes grant development, study design, planning, conduct and analysis. She was a member of the research team that created Duke’s first ResearchKit App: Autism and Beyond. Through DOCR and the MAG she provides guidance and support to researchers interested in using technology. Rebecca provides strategic and operational leadership of engagement activities and support programs for Duke researchers across campus. In the Mobile App Gateway, she works with researchers and administrators across Duke Health and Duke University to ensure coordination and synergy of efforts between various offices, programs, tools, and initiatives. Cory leads the support of an existing catalog of systems including: research in Duke’s Epic EHR, REDCap data capture and survey, Labvantage BioBank and Shared Resources core management, the Clinical Research Management System (CRMS), and Electronic Institutional Review Board (eIRB). He contributes over 20 years of experience in supporting clinical research and health informatics at Duke. Eric contributes his leadership, vision, and strategic planning of clinical and analytic information systems that impact patient care, research and education, of which mobile applications are becoming increasingly important. Eric is the Chief Health Information Officer for Duke Medicine and practices internal medicine at the Durham Medical Center. His research interests have revolved around the use of health information technology to improve the quality of care and patient safety in both the ambulatory and hospital settings. Kristine coordinates programming for a number of groups in the Duke Office of Research Initiatives, including the Mobile App Gateway, the Research Navigators, and Research Onboarding. She'll also help develop and implement programs related to Team Science. Kristine’s background consists of formal training in biochemistry and professional experiences in education, community health, program coordination, marketing, and communications. Through these diverse experiences, she has developed a passion for identifying creative and engaging tools to facilitate and promote scientific research and innovation.